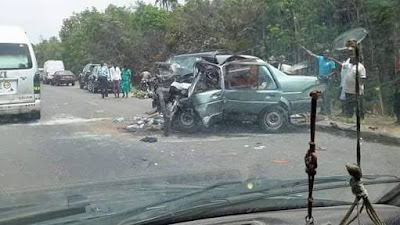 The Federal Road Safety Corps (FRSC) on Tuesday confirmed the death of two corps members in an auto crash in Bayelsa. Sector Commissioner of the FRSC in the state, Mr. Ikechukwu Igwe, said two other corps members were injured in the incident. “Yes, the incident occurred on Monday at Swali Bridge in Yenagoa Local Government Area of Bayelsa; the Tricycle the Corps Members boarded was hit by a Tipper. “The two among them have died while the other injured two are receiving treatment at the Federal Medical Centre Yenagoa. “Today, Tuesday, our personnel will be going to the hospital to check how they are responding to treatment,” Igwe said. “Two of the corps members died as a result of the injuries sustained during the accident, while the other two are being treated by a team of competent consultants at the FMC. “The NYSC family is saddened by this sudden lose. We commiserate with their families on this unfortunate incident and pray for the repose of the souls of the dead and quick recovery of the injured corps members,” she stated.